After 2014’s incredible Lost Together//Lost Forever put the Brighton heavyweights back on top of the UK metal foodchain, the imminent arrival of a new Architects album has filled our crusty blackened hearts with glee. We got vocalist Sam Carter and guitarist Tom Searle to give us their blow-by-blow account of All Our Gods Have Abandoned Us. Get stoked. Tom: “There’s lots of riffs! I’ve never counted myself as much of a ‘riffsman’, so I’m cultivating a lot of confidence now. Don’t worry, they’re coming! This song’s got a bit of a Deftones-meets-Meshuggah vibe to it. It’s a really different vibe, I don’t think we’ve ever done a song that’s quite like that before. All Our Gods Have Abandoned Us is out May 27, via Epitaph Records. 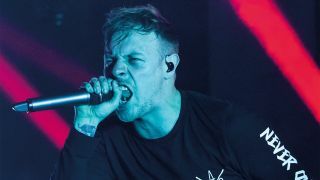 Architects play Download festival on Saturday 11 June.